Lambayeque is a picturesque region that has much to offer: you can get to know the culture of this town not only for its historical monuments such as the Lord of Sipan, its valleys and pyramids, but also for its exquisite cuisine and the nightlife of its people. Take a horse ride through the Historical Sanctuary of Pómac Forests, perform nautical activities in the artificial lagoon of Tinajones Reservoir and let its beaches disconnect you from the city. The city of Chiclayo is known as the “City of Friendship”, because of the warmth of its people. This city is located in the province of the same name, in the Lambayeque region; this city is capital, both of the province, and of the department in which it is located. Among the different tourist attractions that are within the beautiful city of Chiclayo, there are places like the Paseo de las Muses. This walk is known by that name because on that one can find the sculptures of the nine muses of Greek mythology; said walk, is between the avenues Balta Sur and Garcilaso de la Vega. Other interesting sites within the city are Casa Elías Aguirre. This mansion, is an original construction of the eighteenth century, which was modified at the beginning of the twentieth century. This house is located just one hundred meters from the Plaza de Armas of Chiclayo. Located 35 km southeast of the city of Chiclayo (45 minutes by car). 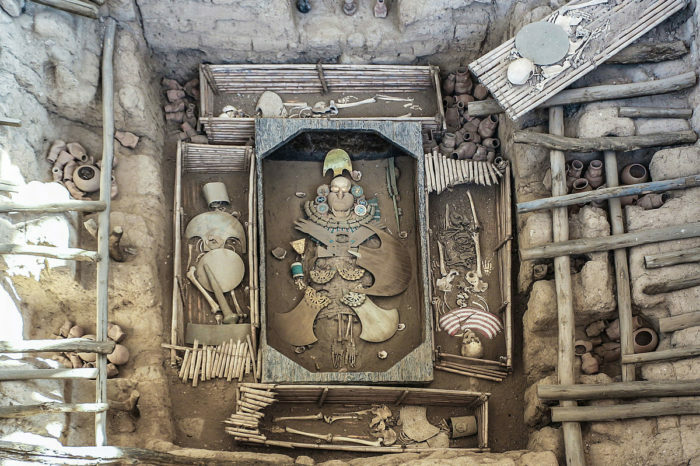 There in 1987 a tomb was discovered with the intact remains of a Mochica character, the majestic Lord of Sipan. The discovery allows us to appreciate the ritual of the funeral of a Mochica ruler, who was accompanied by a warrior, a priest, two women, a child, a dog, a llama and a guardian with his feet amputated. The funeral trousseau includes numerous jewels of gold and silver decorated with turquoises. It dates back to 700 years d.C. and, according to legend, it was founded by Calac, a descendant of Naylamp. Tucume or the Valley of the Pyramids, as it is also called, is made up of 26 pyramids, among which stand out the village Huaca, La Raya, El Sol, and Las Estacas. What do you expect to know the mysteries of Lambayeque?